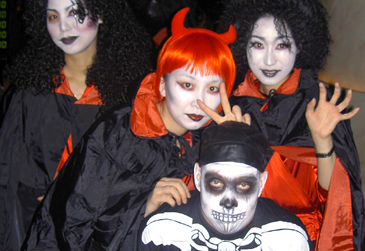 17 Oct. 2005 — Halloween is just around the corner and the Millennium Seoul Hilton's Areno, the hottest venue for nighttime entertainment, is hosting a Halloween party on Saturday, Oct. 29, 2005. In celebration of the festival, Areno will be transformed into a dungeon of creepy crawlies and other dreadfully fun sights. In addition, the staff will be getting in on the act and showing off their ghoulish side by wearing costumes! Playing from hip hop to R&B to the blues, the hot live act Fusion Band will get the party started from 7 p.m. on. As always, there is no cover charge at Areno. So come and enjoy yourselves at Areno's Halloween Party! It promises to be a devilishly fun evening! For reservations or enquiries, please call Areno at (02) 317-3244 or visit our website at www.areno.co.kr.